You’re planning the perfect Cancun all-inclusive vacation, but you’re worried because it’s hurricane season. What should you do? Hurricane season officially runs from June 1 – November 30 in Mexico and the Caribbean. Peak months are September through early October. Statistics show that when traveling during hurricane season, you will most likely enjoy a sunny and storm free vacation. Even with this excellent probability, there are some things you can do to be prepared and make your vacation more enjoyable. Always travel with travel protection: Travel protection can protect your trip from delays, missed connections and even cancelation of your trip due to weather related issues. You may also want to consider a protection plan that will allow you to cancel your trip for any reason. This often costs a little more, but is well worth it if a conflict arises. Use a travel agent to help plan your trip: While planning your all-inclusive vacation to Mexico or the Caribbean, a knowledgeable travel professional can walk you through the ins and outs of traveling during hurricane season. If your vacation is in the path of a storm, a good travel agent can help you make changes to dates of travel, flights or hotels as well as help you in processing any claims from your travel protection. Choose your hotel wisely: While all hotels have plans to deal with tropical storms, some have better facilities and more resources to handle issues that may arise. 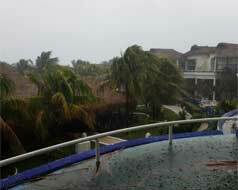 When traveling during hurricane season it’s recommend you stay at 4-star or higher resorts. Know that you may be affected by a storm: Even if you are a few hundred miles away from the center of the storm, your vacation may be affected. The best resource is the National Hurricane Center (http://www.nhc.noaa.gov) as it has all the information you need for storm prediction and forecast. Pack snacks: Pack extra snacks in case of travel delays and unexpected issues. This is especially important when traveling during hurricane season. Always pack easy to transport foods like granola bars, nuts and dried fruits. Pack enough to get you through at least a day or two if needed. Pack games and a good book: It’s a good idea to pack something that will entertain or distract you for a couple days, especially if you’re without power. Pack for possible storms: Always pack a good umbrella and a good quality rain poncho. Stay Connected: While many may want to stay unconnected from technology, it is wise to make sure you have some means of communication to the outside world. Check your calling and data plans with your cell phone provider. Connect to the hotel’s Wi-Fi where possible. While in your hotel room, always plug your cell phone in to keep it charged. Read the hotels policy for tropical weather: All hotels have policies and evacuation plans readily available in the rooms. Before a storm hits make sure you know what to expect of the hotel, where to go and what they expect of you in an emergency situation. Make sure you have plenty of water: Almost every all-inclusive hotel provides several bottles of water in the mini-bar and throughout the room. If a storm approaches make sure to stock up on water in case it’s needed. A tropical storm does not have to ruin your all-inclusive vacation if you’re prepared. Should you run into a storm, make the best of the situation. A tropical storm or hurricane may only last a few hours to a day or two. Chances are the weather before and after will be great.